The Information System of the Sea and Coast (SIC) has been developed by the Geological, Seismic and Soil Service of the Emilia Romagna Region, in order to organize and make accessible in a GIS system a wide set of data on the coastal and marine area, collected by the Region and other entities in nearly 40 years. SIC aims to support ICZM and MSP implementation and is constantly updated with new data and the analysis of news themes. SIC is currently structured in seven thematic areas: (i) Structure and evolution of the coast (in_Coast), (ii) Management of storm data (in_Storm), (iii) Management of offshore sand deposit (in_Sand), (iv) Anthropic uses of the sea (in_Sea), (v) Coastal defence and nourishment (in_Defence), (vi) Subsidence (in_Move), (vii) Coastal risk (in_Risk). What are relevant spatial data to be considered to support MSP and ICZM implementation at sub-national level? How can MSP and ICZM related spatial data (and metadata) be structured according to the requirement of the INSPIRE Directive? How can different datasets be merged and structured to be available in a single tool? How can coastal and marine information systems be used to develop land-sea policies? The Information System of the Sea and Coast (SIC) has been developed by the Geological, Seismic and Soil Service of the Emilia Romagna Region, in order to organize and make accessible in a GIS system a wide set of data on the coastal and marine area, collected by the Region and other entities in nearly 40 years. The original set of data has been integrated with new information acquired through monitoring activities, surveys and GIS-based spatial analysis. Most of the data refer to the regional scale; however the Emilia Romagna Region’s SIC also contains results of studies focusing on the local level. The main objective of the Information System of the Sea and Coast is providing Emilia Romagna Region with a spatial tool supporting Integrated Coastal Zone Management (ICZM) and Maritime Spatial Planning (MSP). In this perspective, the information system is constantly updated and extended with data related to new costal and marine issues. Data included in the Information System of the Sea and Coast are structured to be INSPIRE compliant and are associated to metadata. in_Coast - Structure and evolution of the coast. This section contains data on the physical characteristics of the natural and atrophic coastal systems and related dynamic evolution. in_Storm - Management of storm data. It provides data on forecasting, monitoring and analysis (including damage quantification) of storm events, supporting risk prevention and management. in_Sand - Management of offshore sand deposit. It contains a wide database on geological and geomorphological characteristics of underwater sand deposits. in_Sea - Anthropic uses of the sea. 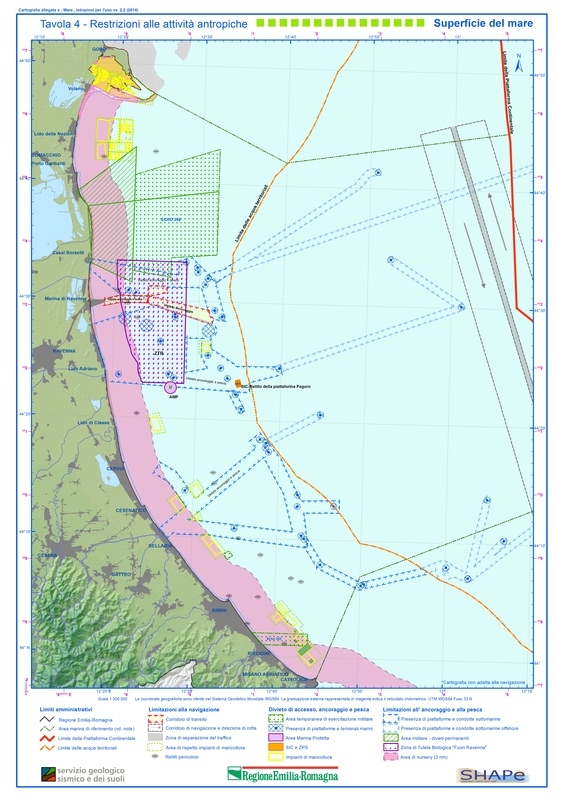 This section of the SIC provides spatial data on main maritime activities, including: fishery, aquaculture, military use of the sea, ports, maritime transport, offshore infrastructures for hydrocarbons exploitation, exploitation of offshore sand deposits, submarine cables and pipelines, restricted areas and legal constrains for maritime activities, nature protection. in_Defence - Coastal defence and nourishment. It provides spatial and quantitative data on coastal defence interventions including hard structures and beach nourishment interventions. in_Move – Subsidence. It gathers geological and monitoring data on the subsidence phenomenon along the coastal area of the Emilia Romagna region. in_Risk - Coastal risk. It provides main maps produced to evaluate costal risks (mainly erosion and sea flooding) and implement related mitigation actions. Some of the core sections (e.g. 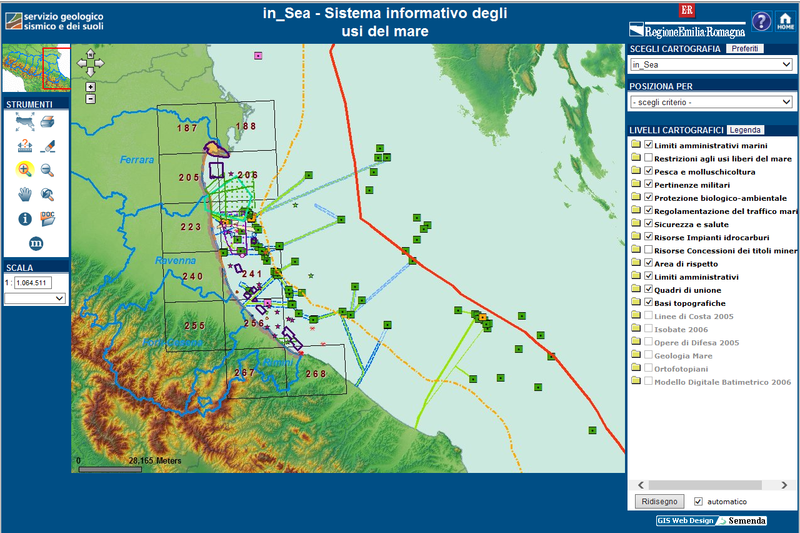 in_Coast, in_Sea, in_Risk) are freely accessible through a Web-GIS interface. Data still to be processed and “sensitive” information are accessible only to technicians and officials of the regional administration. Moreover, OGC based data distribution services (WMS - Web Map Service and WFS - Web Feature Service) are available through the geo-catalogue of the Geological, Seismic and Soil Service. Within the Shape project, SIC data have been used to elaborate thematic maps illustrating the main maritime activities occurring at the four levels of the marine system: surface, water column, seabed, sub-seabed. The SIC information system is a dynamic tool that is maintained alive by the Emilia Romagna Region. It can be considered as a spatial data management tool at the sub-national level, to be used as possible inspiration by other regions facing similar challenges. Moreover, part of the data included in the SIC contributes in feeding the Adriatic Atlas to support ICZM and MSP developed within the Shape project.